PICK A MAT, ANY MAT! Here at PromoMatting we offer indoor, outdoor, molded, and anti-fatigue custom floor mats. We also offer virtually unlimited choices for imprinting a logo, allowing you to customize the perfect mat for your individual needs. We use cutting-edge technology to print graphics with extremely high definition. Our mats are equipped with premium-quality rubber or vinyl backing to eliminate slippage while also minimizing the amount of dirt, dust, and debris that would otherwise settle in the doorway. As a part of the promotional products industry, we know exactly how important it is to ensure that a brand stands out in the crowd. We also know that having an eye-catching logo is the only surefire way to create impressions on as many potential customers as possible. We take a lot of pride in our mats because they satisfy many roles, from marketing your brand to keeping your entrances pristine! ARE CUSTOM DOOR MATS REALLY WORTH THE INVESTMENT? A highly durable and aesthetically appealing product is only part of what we offer with our floor mats. Our products also provide significant financial advantages as a marketing tool. 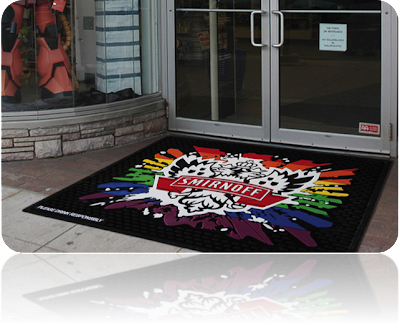 The average cost per impression for our custom floor mats is $0.005. That’s two hundred impressions for every penny that you spend! Talk about building brand awareness. Promotional mats also offer significant sales impact, as shown from a recent study we conducted. When a local liquor store placed custom floor mats in front of displays and shelves, they experienced a combined increase in sales of approximately 43% for those brands. This drastic jump in revenue occurred in just a three -week period. Well, if you think about it, custom door mats are a source of advertising that has little or no competition. It’s like having the only commercial on TV! 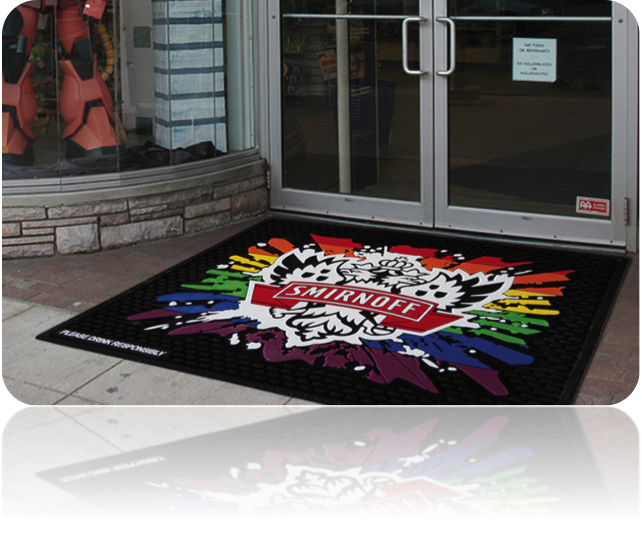 Custom floor mats are a tangible actual product that your customers can touch, feel, and connect with. 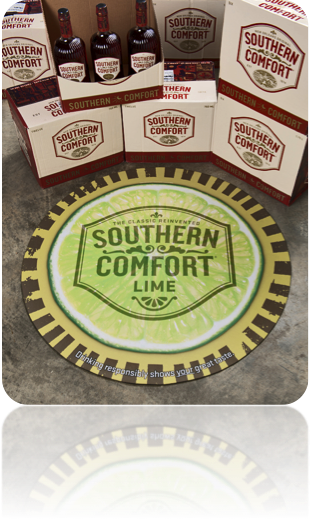 Our mats make a great addition to any company’s marketing campaign as they help maximize brand recognition. Studies have concluded that more than 50% of consumers who come across a logo mat will remember the advertiser. WALK ALL OVER US — WE ENCOURAGE IT. Floor mat marketing is arguably the last frontier of advertising. There’s no reason why you shouldn’t take advantage of this untapped resource right under consumers’ feet! Don’t just take our word for it — the facts will “floor” you! HOW EFFECTIVE ARE MATS IN PROMOTION? Interested to know how mats can be used as promotional tool? Check out some companies who have employed mats in their marketing campaign! Add your examples in the Comment Section below. I really love the customized mats and the other items that you customized! Nicely done. How can I get items like that? It is a good investment because these mats are very useful not just for advertising. Compared to other advertising means, this is way cheaper too. Businessmen will definitely have a bang for their buck. What a fantastic idea to get your brand out there. They look great and I agree a cheap way to advertise as well.